Price adjustments will be reflected in the cart. For availability information please contact us. All prices are in US dollars and are subject to change without notice. Prices do not include shipping charges. An additional OEM discount applies on orders over 9 pieces. Contact factory for pricing. If ordering from or shipping to Australia, China, Hong Kong or Israel please contact your distributor. The LDxCHA product family has current levels from 2.5 A up to 15 A. The following models are available: LD2.5CHA (2.5 A), LD5CHA (5 A), LD10CHA (10 A), or LD15CHA (15 A). These drivers meet laser compliance requirements from 3 V with a single 5 V supply, and up to 28 V with an additional 30 V power supply, supporting applications such as materials processing, industrial laser cutting, and laser diode bars / stacks. This product family supports A & B type laser diodes. 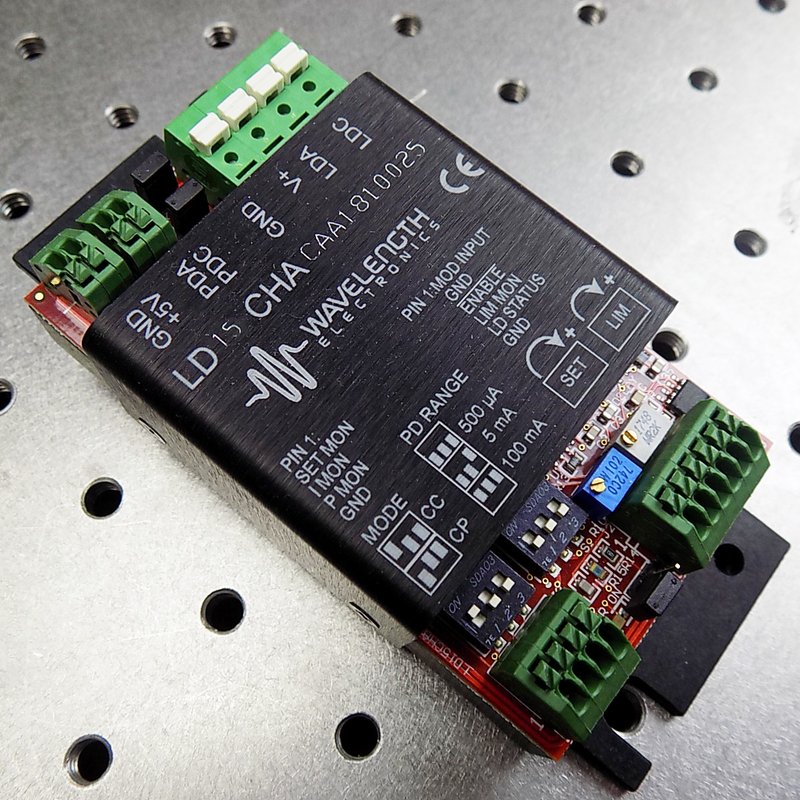 The new circuitry in the LDxCHA allows for the laser diode current limit and the laser diode current setpoint to be fine-tuned without output current enabled to the laser. This allows users to set the specific safety and output levels required without risk of overdriving the laser during initial configuration. The LDxCHA drivers, with their small size and easy mountability, can be attached directly to an optics table or designed into a system. Two trimpots set the current limit and current setpoint, while five spring loaded terminal blocks allow for simple wiring. Built-in safety features ensure robust designs for real world operating conditions: clipping current limit ensures that the output current will never exceed the setpoint; and slow start circuit ramps the output current. Long‑term reliability means better up-time, fewer service calls, and more satisfied customers. Thoughtfully designed features provide valuable benefits and protect the laser against operational anomalies. Download the brochure to view a more detailed specification chart, and then call Wavelength’s sales engineers so we can help you choose the right driver for your application. Free, effective, and responsive technical support is available to simplify integration of Wavelength products into your OEM design. 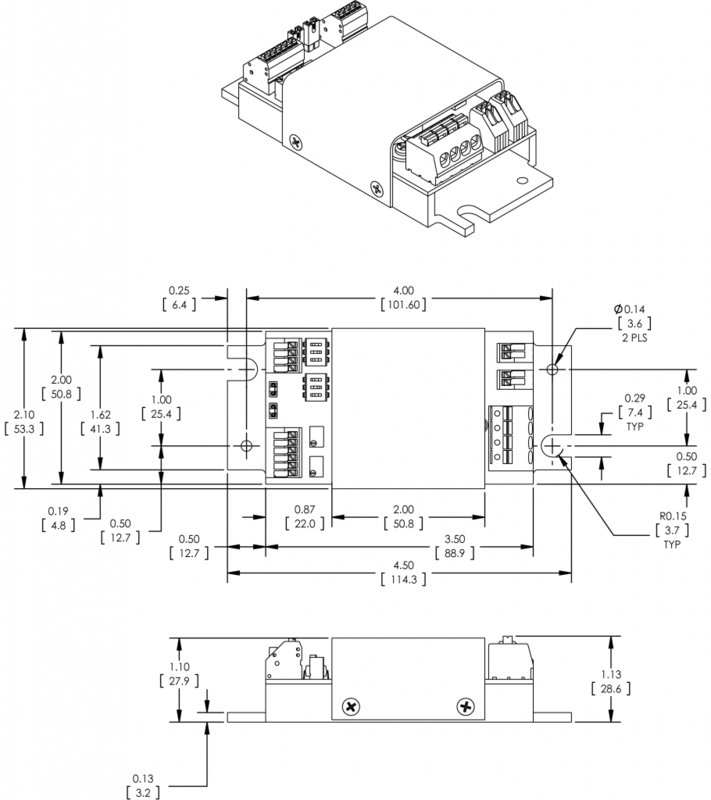 Standard product can be easily modified to meet your application requirements. On-Delay: 2 sec. After the delay, current will rise to the level dictated by the setpoint voltage. AN-LD11: How to Add Complex Technology — Build or Buy? FAQ1001: What does the Compliance Voltage specification in laser diode drivers mean? FAQ1014: What DC power supplies do you recommend to achieve the stability specifications listed in your manuals? 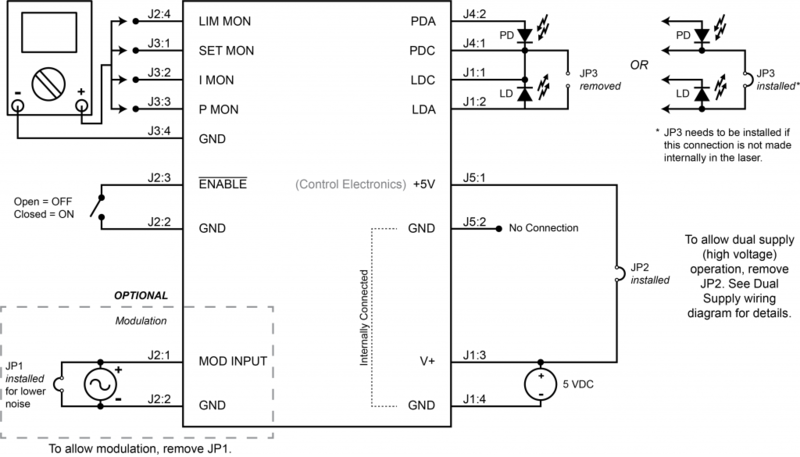 FAQ1015: Should I use a switching power supply for my application? FAQ1016: How do I view and print your manuals on-line? FAQ1017: An empty screen appears when I try opening a PDF manual. What does this mean? FAQ1019: Which address do I use to remit payment or a purchase order? FAQ1022: Where do I send my unit for repair or calibration? FAQ1150: What are the differences between a wavelength meter and a spectrometer? FAQ1158: What software can I use for mechanical downloads? FAQ1161: What are some important parameters to consider before purchasing a product? FAQ1167: How are diode lasers used in materials processing, and what Wavelength Electronics drivers can be used for this application? Not seeing what you need? Wavelength Electronics solves problems for researchers and OEMs that use high precision laser diodes, quantum cascade lasers, and thermoelectrics. To purchase, contact us directly or locate a distributor near you. Copyright © 2008-2018 by Wavelength Electronics, Inc. - All Rights Reserved. LinkedIn, the LinkedIn logo, the IN logo and InMail are registered trademarks or trademarks of LinkedIn Corporation and its affiliates in the United States and/or other countries. LabVIEW is a registered trademark of National Instruments.